Wings of Argidae from Goulet and Huber (1993, fig. 26) . 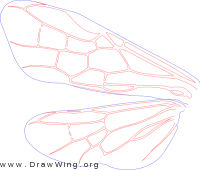 Wings of Scobina dibapha = Labidarge dibapha. From Comstock (fig. 71) .